저희 텍스트북스 출판사에서 공급하는 신간 도서를 소개하고자 이렇게 메일을 보내드립니다. 교수님께서 강의 및 연구에 도움이 되었으면 바라며, 자세한 문의는 텍스트북스로 하시기 바랍니다. ※ 견본용 도서는 메일(회신)로 신청하시고 소속, 주소, 전화번호 등을 반드시 알려주시기 바랍니다. This bestselling undergraduate quantum mechanics textbook is now available in a re-issued, affordable edition from Cambridge University Press. The text first teaches students how to do quantum mechanics, and then provides them with a more insightful discussion of what it means. The author avoids the temptation to include every possible relevant topic, instead presenting students with material that they can easily focus on in a complete treatment with few distractions and diversions. Fundamental principles are covered, quantum theory is presented, and special techniques are developed for attacking realistic problems. The innovative two-part coverage is entertaining and informative, organizing topics under basic theory and assembling an arsenal of approximation schemes with illustrative applications linked closely to the text. 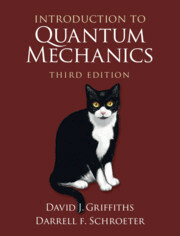 Changes and additions to the new edition of this classic textbook include a new chapter on symmetries, new problems and examples, improved explanations, more numerical problems to be worked on a computer, new applications to solid state physics, and consolidated treatment of time-dependent potentials. David J. Griffiths received his B.A. (1964) and Ph.D. (1970) from Harvard University. He taught at Hampshire College, Mount Holyoke College, and Trinity College before joining the faculty at Reed College in 1978. In 2001?02 he was visiting Professor of Physics at the Five Colleges (University of Massachusetts, Amherst, Mount Holyoke, Smith, and Hampshire), and in the spring of 2007 he taught Electrodynamics at Stanford. He retired in 2009. Griffiths is a Consulting Editor of The American Journal of Physics, and a Fellow of the American Physical Society. In 1997 he was awarded the Millikan Medal by the American Association of Physics Teachers. He has spent sabbaticals at SLAC, Lawrence Berkeley Laboratory, and University of California, Berkeley. Although his Ph.D. was in elementary particle theory, his recent research is in electrodynamics and quantum mechanics. He is the author of over fifty articles and four books: Introduction to Electrodynamics (4th edition, Cambridge, 2013), Introduction to Elementary Particles (2nd edition, 2008), Introduction to Quantum Mechanics (2nd edition, Cambridge, 2016), and Revolutions in Twentieth-Century Physics (Cambridge, 2012). Darrell F. Schroeter is a condensed matter theorist. He received his B.A. (1995) from Reed College and his Ph.D. (2002) from Stanford University where he was a National Science Foundation Graduate Research Fellow. Before joining the Reed College, Oregon, faculty in 2007, Schroeter taught at both Swarthmore College and Occidental College. His record of successful theoretical research with undergraduate students was recognized in 2011 when he was named as a KITP-Anacapa scholar.